Do Capuchin Monkeys Make Good Pets? The first thing you must do if you’re thinking of having Capuchin monkeys as pets is to check the laws for exotic pets in your State. It is extremely important to know that capuchin monkeys, like other primates, can transmit certain diseases to humans. After rabies, Hepatitis is the most common. Capuchins can also be infected with more common ailments quite easily from humans since their immune systems are not as strong as ours. 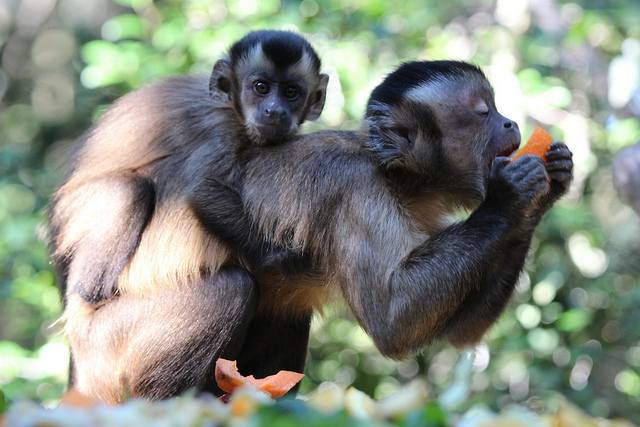 Monkeys are messy, and most capuchin owners use diapers for their monkey’s entire life. Since they can live for as long as 35-40 years in captivity, that’s a lot of diapers! They may also need to be bottle-fed for their entire lives. Capuchins are mostly kept on leashes both inside and outside of the home. Capuchin owners treat their monkeys like babies and commonly dress them up. Capuchins can grow to weigh up to 4 lbs but the average weight is 2 pounds. 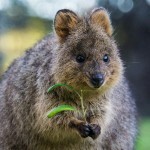 They grow twelve to twenty-two inches in height and their tails are also usually the same length as the body. These monkeys can become quite troublesome and aggressive when they reach sexual maturity, which can be difficult for the owner to handle. Capuchin monkeys sold as exotic pets are taken from their mothers at an extremely young age. Since wild baby Capuchins stay with their mother for the first few years, there is a strong possibility that this practice causes permanent emotional and psychological damage to both the mother and the baby. Another controversial practice which has lead to stricter laws for owning exotic pets is that some owners are urged to have all four of the monkey’s canine teeth (large, pointy teeth) removed to prevent serious bite injuries down the road since bites are inevitable. Few veterinarians will perform this procedure. Capuchins in the wild will eat bugs, fruit, small birds, nuts, and flowers. Mimicking their natural diet in captivity is difficult and many pet capuchins develop diabetes due to improper nutrition, despite many owners knowing better. Many capuchins used to be sold as service animals but that practice has dwindled due to the Americans with Disabilities Act that was passed in 2010 that no longer recognizes primates as service animals. The American Veterinary Medical Association’s statement regarding the discouragement of primates as service animals has also made it difficult to find an exotic vet that treats Capuchin monkeys. In the past, capuchins were trained for the purpose of helping quadriplegics around the house. They were trained to open bottles, microwave food and even wash the face of the patient. You may also recognize the capuchin monkey from the days of the organ grinders. 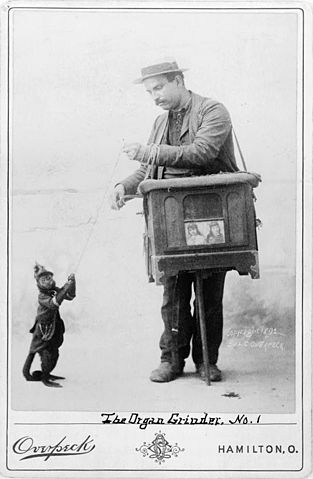 “Organ grinder with monkey” by Overpeck (photographer, Hamilton, Ohio, USA). Capuchin monkeys’ name comes the Franciscan Capuchin, whose cowl is similar to the coloration of the monkeys. 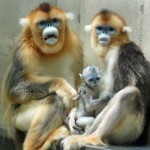 They belong to the Cebinae family and Cebus genus. The range of capuchin monkeys includes Central America, South America, and as far south as northern Argentina. They are also known as sapajou. In the wild, Capuchins live only for fifteen to twenty-five years. They stay awake during the day and sleep at night except for the midday nap they take. During the day, they spend most of the time looking for food and at night, they sleep on the branches of the trees. Capuchins are social animals and live in a group of eight to forty males, females and their children. The area where the whole group lives together is marked with the smell of urine and intruders are not welcomed. A strong male controls the whole group and mates with the rest of the females in the group to produce offspring. Male and female capuchins smell each other to know whether the other is sexually mature or not. A female capuchin monkey has the capability of reproducing after every two years. Their gestation period lasts from five to six months. The offspring clings onto the chest of the mother until they grow bigger, at which point they shift clinging to their mother’s back. Mothers keep a close eye on them until are three months old. Male capuchins have no participation in the upbringing of their offspring. Capuchin monkeys are considered to be the most intelligent of all present species of monkeys and have been known to use various tools to assist them in their daily life. They drink the juice of palm nut fruits from the tip and then let them dry. After they dry, they will collect them and break them with the help of a big boulder collected from the rivers. They have the ability to walk on their feet with food and tools in their hands. They are clever enough to find food on the ground as well as on trees. Unlike other monkeys, they are omnivorous. Along with eating food like seeds, nuts, fruits, flowers they also feed on eggs of birds, small birds, insects, spiders, reptiles, bats and even small mammals. Some of them who live near water also feed on shellfish and crabs, which they crack open with the help of stones. 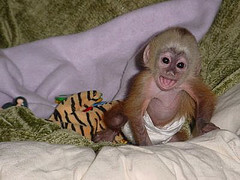 If you are considering getting a capuchin monkey as a pet, I would urge you to consider other options. Think of the 40 years of care and diaper-changing before giving in to one of those cute, little faces. Again, check with your State’s laws regarding owning a primate as an exotic pet. I’m in South Africa and a monkey parent. There are not many people who can live with monkeys. They are destructive, and sometimes aggressive and messy. I’ve been living with monkeys for about 40 years. If you can take responsibility for a proper diet, stimulation and medical care, if you are prepared to have a bite or a scratch at times and you still want one, then maybe you will be one of the few people who can enjoy them. I could never imagine my life without my monkeys. Here [in South Africa], there are a lot of breeders of Tufted Capuchins and they sell to anyone who wants a monkey. After a few months they realize this nice little baby has turned into a busy, messy and destructive youngster. Most of the time these poor babies have to be re-homed. I wish everyone considering to keep a monkey as a pet should first get some experience before buying one. 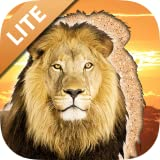 Are there any particular animals that you would like to learn more about? What is really disturbing to me are the monkey owners who know there are probably thousand of monkeys who are being mistreated who will never get relief until they die from illness and yet oppose legislation that would prevent this. When laws are passed, they allow people who already have monkeys before the ban goes into effect to keep their animals, but still, they don’t seem to see how much this would help monkeys. I know monkey santuaries are a great place to learn that monkeys are much better off in the wild. The money you would spend (if you’re responsible) on a monkey and its care could be used instead for a trip to South America to see monkeys up close in the wild and would cost less. Monkeys are really not happy as pets. Once they mature, they show their unhappiness by biting. An adult Capuchin ( a monkey usually no bigger than a domestic cat) can tear a big chunk of flesh from you. 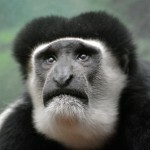 Once a monkey bites, it is usually kept in a cage for its entire life, where it will be angry or frustrated. Some owners will then have the monkey’s teeth pulled which can cause them health problems. Owners will also hire animal trainers to mentally break the animals by torturing them by beating them until they stop fighting back, electric shocking them, sticking their finger down their throat when they bite, so that the animal will be controllable. The result is an unhappy animal. This is what animal trainers do to make monkeys perform tricks. I can’t imagine people who care about monkeys would allow monkeys to be treated like this. As long as people buy these animals as pets, their money will cause these animals to end up with animal torturers. 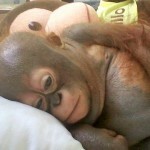 I went to a lecture once and a monkey breeder told the audience that a monkey he kept as breeder would have nothing to do with him because he took her babies to be sold. This was his warning to the pet buyers if they were planning to breed to have someone else take the babies. Please don’t support the cruel trade in monkeys. I was heartbroken when my parents told me I couldn’t have a pet monkey. I learned everything I could about them and met monkey owners whose monkeys seemed to like me. Now, many years later, I’m grateful I didn’t get a monkey. And so are the monkeys. These animals undergo enormous trauma when separated from their mothers to be sold into the pet trade. One sanctuary in the U.S. alone is filled with ex-pet monkeys who became a burden or attacked their owners. If you really want to be with monkeys, I urge you to volunteer at a reputable primate sanctuary. I think you will realize that it will prevent years of grief for you and the monkeys. Thank you for your input, Kelly. I do appreciate what you’re saying. I’ve heard about monkeys that attack their owners. It’s sad for the owners, but I feel more compassion towards the monkeys. I can’t imagine the torment they must go through to be ‘enslaved’ by humans. I’m glad I never got one either, although if I had, know that I would have loved it to pieces. All the best, Kelly. I’m in South Africa and a monkey parent. 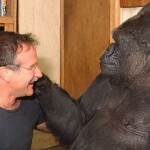 there are not many people who can live with monkeys. they are destructive, sometimes aggressive and messy. I’ve been living with monkeys for about 40 years. If you can take responsibility for a proper diet, stimulation and medical care. If you are prepared to have a bite or a scratch at times and you still want’t one. then maybe you will be one of the few people who can enjoy them. I could never imagine my life without my monkeys. Tufted capuchins. here there are a lot of breeders and they sell to anyone a monkey. after a few months they realise this nice little baby turned into a busy, messy and destructive youngster. most of the time these poor babies have to be rehomed. I wish everyone considering to keep a monkey as a pet should first get some experience before buying one. wow…..how rude. you think just because I’m 12 means I’m not prepared, devoted or educationally ready for a monkey. listen, I get SO much hate but I’ve ben doing research for 2 years! I’ve visited South Africa, Costa Rica and Belize numerous times to see, learn, and work with all sorts of monkeys. 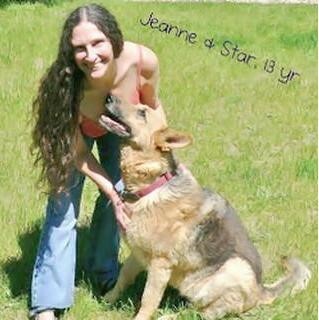 did you do the same when you were 12 Jeanne? could you actually even SAY you did? I don’t think so. I’m ready for a monkey. IM NOT an out of the day ordinary child. I’m homeschooled, so I can give the capuchin affection and love everyday all day. and actually , its good that I’m not 20 or 30 and I want to get a capuchin because they live 30 to 40 years if well taken care of, and I wont even be able to care for the monkey when I’m 70 something. I have a huge yard where I can make an outdoor suite for the monkey with a 15 x 20 ft. cage because my backyard is 15 anchors. I and my parents own other exotic pets like 4 horses, 6 cows, 28 chickens, 3 pigs, 2 tigers, 2 leopards, 2 raccoons, 3 ducks, a parrot and 2 marmoset monkeys. so I’m prepared on getting ONE capuchin. now ANY GOOD and actual tips, or am I going to waste my time writing this, now give me some actual good tips. I stand corrected, Chloey. I’m so happy to hear that you’re having such an extraordinary childhood, learning about all the animals you live with. I would have given anything to do that as a child. My chance only came after I was in my 30s, and I took full advantage of that, living with goats, chickens, mini pigs, raccoons, possums, turtles, squirrels, bearded dragons, cats and dogs. I feel like I’m leaving something out, but no matter. When I was a child I fantasized about having a monkey. I still do, but it’s not possible in this lifetime, for me. 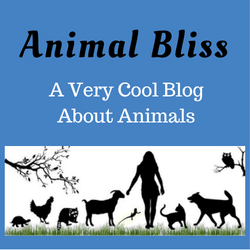 If you do get your capuchin monkey, I’d love it if you would send me photos via email at jeanne@animalbliss.com Or, if you’d like to write a blog post on that, or any of the other animals you have, I’d be delighted to publish it. Let me know. Peace. P.S. I hold no hate for anybody. It’s not in my nature. Hello, I’m 12 years old and my parents are getting me a white faced capuchin monkey this summer. I did research since I was 10 and I know all there is to know about them. I feel dedicated to them, any advice for me? And if you say “it’s too much work” I don’t care and I’m still getting one. But I would like to know all the positives about owning one, because I hear a lot of negative things.. Thanks! My recommendation for a 12-year-old wanting to gt a capuchin monkey? Please don’t do that. Please, just don’t. 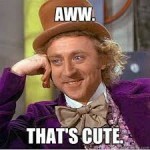 But thanks for visiting my blog. Hi I am also from South Africa and i have a lovely Capuchin Monkey and he is the love of my life but yes i agree if you want one as a Baby (pet) get all the info as it is a lot of work (24/7) they take all your time please do not get one for the fun of it you really need to know all the facts. I love my baby he is almost 3 year and for me it is the best thing i ever did but still please remember your whole life changes once you get one. Thank you for your comment and telling us about your Capuchin Monkey, Jackie. I’ve always loved monkeys and as a little girl, I used to fantasize about having one. I do realize they are a lot of work and definitely not for everyone. I’m glad you love yours so much. He must bring you much joy. Have fun! Hi. I live in South Africa on a game farm.. We have n Capuchin . He is now Just over a year old.. He is exactly like a baby and todler.. He behaves the way we let him.. If his nauthy he goes to his cage ..he is very clever and know when he doing something wrong. He goes everywhere with us in his traveling cage. The love our lives.. He is good with children and love to play with kids.. Your prime mate will behave they way you teach him.. Thanks for sharing, Louise. Your Capuchin sounds like a lot of fun. I can imagine he can be a handful, though, just like babies and toddlers. 🙂 I’m happy that you’re visiting my site from South Africa. Nice! Peace. Hi there. I have red everybody comments on capuchin primates and I agree to disagree..They are very intelligent, their DNA is 97% to that of humans. They will behave they way you bring them up.. The same way as kids.. Thank you for your comment, Louise. 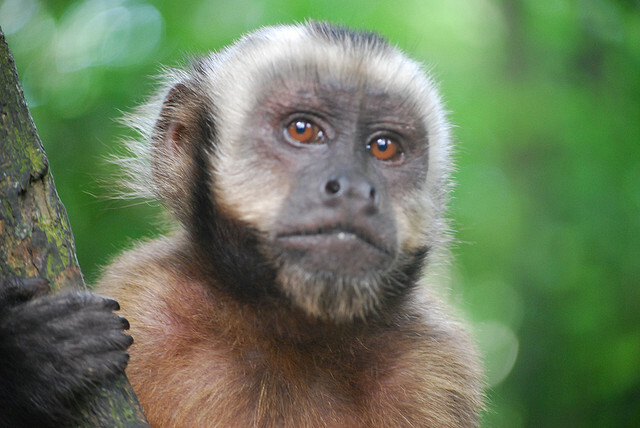 Have you had experiences with Capuchin monkeys? I always wanted one when I was growing up. I had raccoons instead. lol I agree that they’re highly intelligent beings. I’d love to get to know one (or more). Sigh … Maybe next lifetime. I hope you’ll visit again! Peace. Please i would like to get maybe some advice concerning these monkeys . Please Gale McCarron , can you text me at (301) 291-5270 so that we discuss regarding the monkey ?? I’m so glad I found your blog via your comment on my post this morning, Jeanne. I love animals. We once had a baby monkey live with us for a short while. He landed with us when his Mum died.He was a delightful little chap, but could get a bit aggressive too. I would be wary of keeping a full grown monkey. PS: I live in India and this little chap was a Rhesus Macaques. Funny to think of monkeys eating me, but I guess they’re more like us than I realized. You have given me some great insight on these animals. I must admit they are so cute but I would not own one. Very tempting though! Thanks for sharing. A very interesting post. I wouldn’t have known what is involved in caring for a Capuchin monkey and having read your post, I am really surprised people do keep them as pets. It would be interesting to find out how to care for canaries kept as pets. Beata recently posted…How personal can a blog be?